Summon: +1/+1 for each creature in your discard pile. 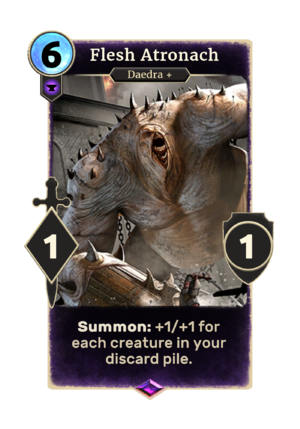 Flesh Atronach is an epic Endurance creature card. It is part of the Core Set. This card's summon ability applies the Grim Harvest card effect. Flesh Atronachs first appeared in Daggerfall, and later reappeared in Shivering Isles, and ESO. For more information on Flesh Atronachs, see the lore article. This page was last modified on 24 March 2019, at 20:53.